Hebrew author; born at Copenhagen 1758; died at Berlin (June?) 14, 1804. He studied at the University of Königsberg under Immanuel Kant, and acquired a fine Hebrew style from Moses Mendelssohn and Naphtali Wessely. A proposal to appoint him professor of Oriental languages at the University of Königsberg was resisted by Kant, as dean of the faculty of philosophy, on the ground that "it is hardly possible for a Jewish teacher of the Hebrew language to abstain from the rabbinic expositions to which he has been accustomed from his youth." Euchel was one of the founders of the periodical "Ha-Meassef" (1783), the organ of the Biurists. For some time subsequently he was bookkeeper in the establishment of Meyer Warburg in Berlin. In the winter of 1791 he founded, with other young scholars, like Joseph Mendelssohn, E. Wolfssohn, and N. Oppenheimer, the Gesellschaft der Freunde in Berlin. Euchel's' chief works are: "Gebete der Deutsch-Polnischen, Juden" (translated from the Hebrew, with notes, Ratisbon, 1786-88; Vienna, 1790-98); "Die Sprüche Salomos" (translated from Hebrew, with Hebrew commentary, Berlin, 1789-98; Offenbach, 1805-08); "Ist nach Jüdischen Gesetzen das Uebernachten der Todten Wirklich Verboten?" (Breslau, 1797-98); "Mose Maimuni's 'More Nebuchim,' mit einem Kommentar von Mose Narboni und einem Kommentar von S. Maimon" (Berlin, 1791; Sulzbach, 1829). 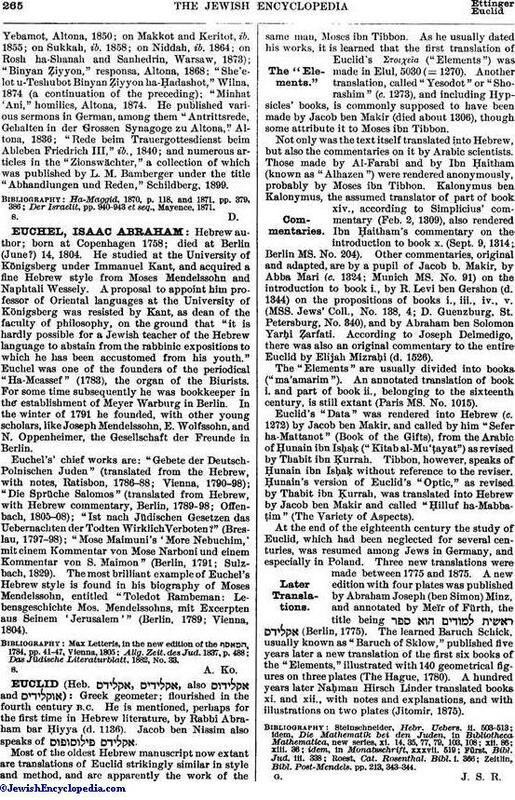 The most brilliant example of Euchel's Hebrew style is found in his biography of Moses Mendelssohn, entitled "Toledot Rambeman: Lebensgeschichte Mos. Mendelssohns, mit Excerpten aus Seinem 'Jerusalem'" (Berlin, 1789; Vienna, 1804). Das Jüdische Literaturblatt, 1882, No. 33.